Let them eat cake! 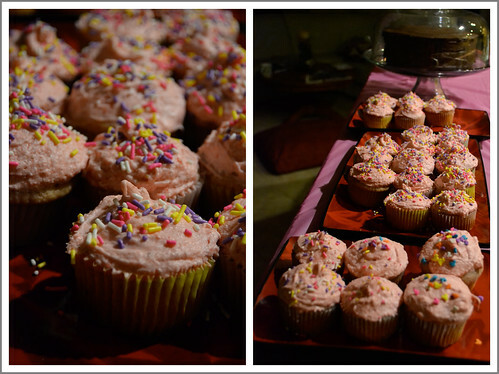 And cupcakes! If you overwhip the chocolate frosting, just add water, a drizzle at a time, to make it glossy and smooth again. 1. Preheat the oven to 350ºF. Grease two 9-inch (22.5cm) round cake pans with cooking spray; line the bottoms with parchment paper and grease the paper. To make the cake, in a small bowl, whisk together the espresso powder and boiling water; let cool slightly. Whisk in the cold water, vanilla, oil and eggs. 2. In a large bowl, whisk together the flour, cocoa powder, brown sugar, granulated sugar, baking powder, baking soda and salt. Whisk the egg mixture into the flour mixture until just combined; divide the batter between the prepared pans. Bake until springy to the touch and a toothpick inserted in the center comes out clean, 25 to 30 minutes. Let cool completely in the pans set on a wire rack. 5. Roll your eyes (or blush, maybe you’re a prude) as people make inappropriate noises while they enjoy this cake and exclaim how they can’t believe it’s GFCF. 1. Preheat the oven to 350ºF. Line a 12-cup muffin pan with paper liners. To make the cupcakes, in a small bowl, whisk together the flour, baking powder and salt. 3. In a large bowl and using a handheld electric mixer, beat the shortening on medium-high speed until fluffy, about 1 minute. Add the granulated sugar and beat until fluffy, about 2 minutes. On medium speed, beat in the eggs, one at a time, until combined. Alternately add the flour mixture and the strawberry mixture, beginning and ending with the flour mixture and beating until just combined. Pour the batter into the prepared muffin pan until each cup is two thirds full. Bake until the cupcakes are springy to the touch and a toothpick inserted in the center comes out clean, 18 to 20 minutes. Let cool completely in the pan set on a wire rack. 4. To make the frosting, in a large bowl and using a handheld electric mixer, beat together the shortening, confectioners’ sugar, strawberry puree and salt on medium-high speed until fluffy. Pipe or spread over the cooled cupcakes; top with sprinkles. I’d recommend you make two batches of the strawberry cupcakes — if you want a chance to enjoy ANY of them before they’re devoured by everyone else! One of the cuisines I miss most being GFCF (gluten-free, casein-free) is Italian. Pretty much everything has wheat or cheese (which, sidenote!, is rather ironic, seeing as how one in every 106 Italians suffer from celiac disease) and food substitutes are never as good as the real thing — actually, more often than not, they’re disgusting. Watching others eat pizza is particularly painful since gluten-free pizza dough is usually cake-y, thick, tough, and tasteless. Until now! A few months ago, I bought Silvana Nardone’s Cooking for Isaiah. Ms. Nardone is the Editor in Chief of Every Day with Rachael Ray, and while I don’t really like RR, the idea of a cookbook created by a mother raising a GFCF child and having to find food he can actually enjoy appealed to me more than, say, someone like Gwenyth Paltrow publishing a cookbook to tell the world what an amazing cook she is (let me tell you how I reallllly feel). I had been avoiding using recipes from her cookbook despite having read through most of them out of fear that they would be disgusting and I would be disappointed. 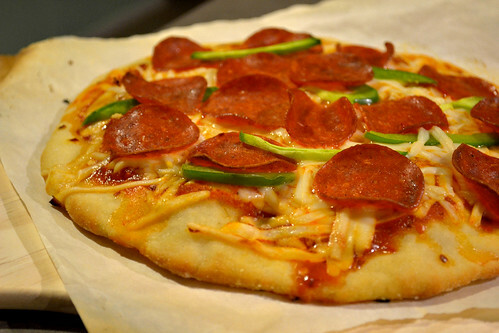 Tonight for dinner, I decided to make her Pepperoni Pizza. IT WAS AMAZING. The crust had the perfect consistency: fluffy, soft on the inside and slightly crunchy on the outside and full of taste. I attribute it to how Ms. Nardone found the perfect combination of gluten-free flours — instead of using just gluten-free bread mix, or gluten-free rice flower, she mixed multiple flours. But I’ll spare you the endless gushing and I’ll just share the recipes. For full size pictures, click on the images! In a large bowl, whisk together the rice flour, tapioca flour, potato starch, salt and xanthum gum. Transfer to an airtight storage container and store in a cool, dry place or in the refrigerator. 1. In a large bowl, whisk together the flour, yeast, sugar and salt. Add the egg whites, olive oil and water. Using a wooden spoon, beat until the dough pulls away from the sides of the bowl. 2. 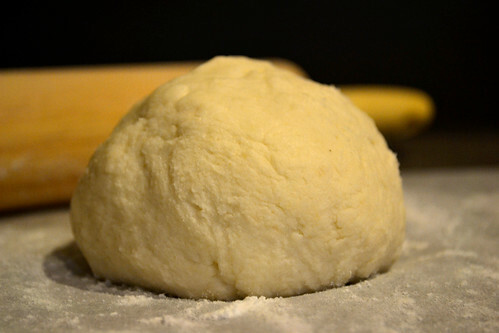 Divide the dough into two equal pieces; place each on a lightly floured, 12-inch (30cm)-long piece of parchment paper. Lightly flour the top and, using your fingertips or a rolling pin, press the dough out to make a round about ¼ inch (9.5cm) thick. Cover loosely with plastic wrap and let rest at room temperature for about 30 minutes. 3. Position a rack in the bottom of the oven with a baking stone on the rack and preheat to 450ºF. 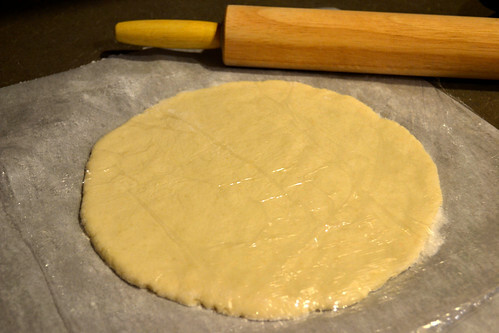 Working with one piece of dough at a time, slide the dough with parchment paper onto the preheated baking stone and bake until puffy and crisp on the bottom, about 8 minutes. Let cool on a wire rack. Repeat with the remaining dough. 1. In a small bowl, stir together the tomato puree, olive oil, salt and water (my experience was that you don’t really need the water). Although these pies are kind of small, I think you could definitely feed four people with them… unless you have HUGE appetites! This fed three of us, and the boys had extra slices!